The National Trust is a charity that looks after special places for ever, for everyone. From exploring the outdoors, discovering historic homes, relaxing in a holiday cottage, or taking in the views with a cream tea, a National Trust gift card can be used towards experiences like these at over 500 special places. The card can be put towards holiday cottage bookings made by phone and at our on-site cafes, shops, and restaurants. It can be used to gain entry to the places we look after, and be put towards National Trust membership itself for yearlong free admission to over 500 places. Please print the page and take to a National Trust property in England, Wales or Northern Ireland. Present the gift card at the till. This card expires either 24 months after the date of issue or 24 months from the last transaction (whichever comes later). Any balance is cancelled on expiry. This card can be used at most National Trust properties (in England, Wales & NI), in shops, cafes, admission points or towards membership fees & Historic House Hotels. It can be used for telephone National Trust holiday cottage bookings. This card cannot be used for other telephone purchases or any online purchases. It cannot be accepted at certain sites, or outlets not operated by the National Trust. 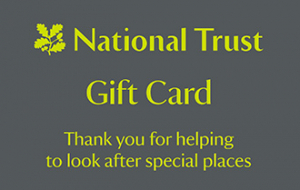 For more information: www.nationaltrust.org.uk/giftcards.